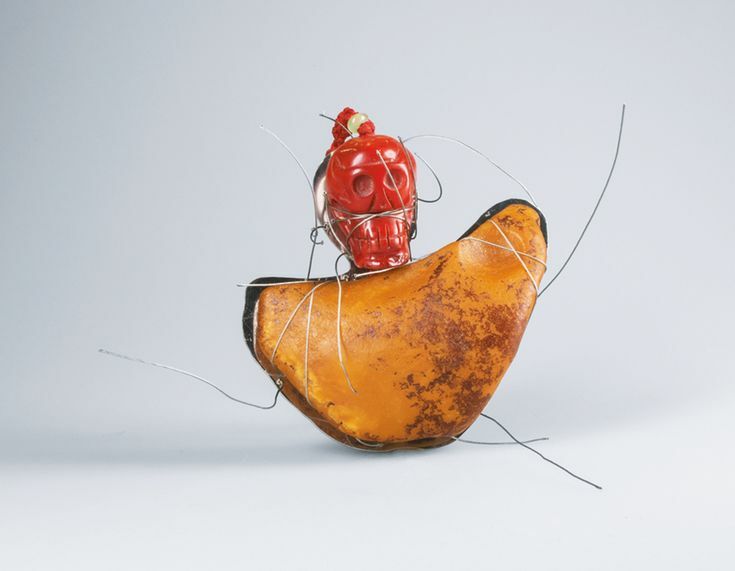 Italian artist, graduate of the Jewellery School « Interno 7″ in Roma and the « Atelier Aura » in Munich. Laureate of the Gallery of Art in Legnica Award in 23rd Legnica International Jewellery Competition CLASSIC. « The works of Elisabetta Duprè evoke a rhythm comparable to the changing of seasons, day and night, a beating heart, a piece of music. Dozens, even hundreds of tiny pieces of silver and gold, small cubes, cups, flat bars, occur in a sequence, as if they were marking time, almost suggesting the ticking of a clock or the swinging of a metronome.Her work is essentially based on minute detail. Surfaces are carefully treated to acquire the desired texture and colour. The pieces are perfect in their imperfection and apparent randomness becomes fundamental. 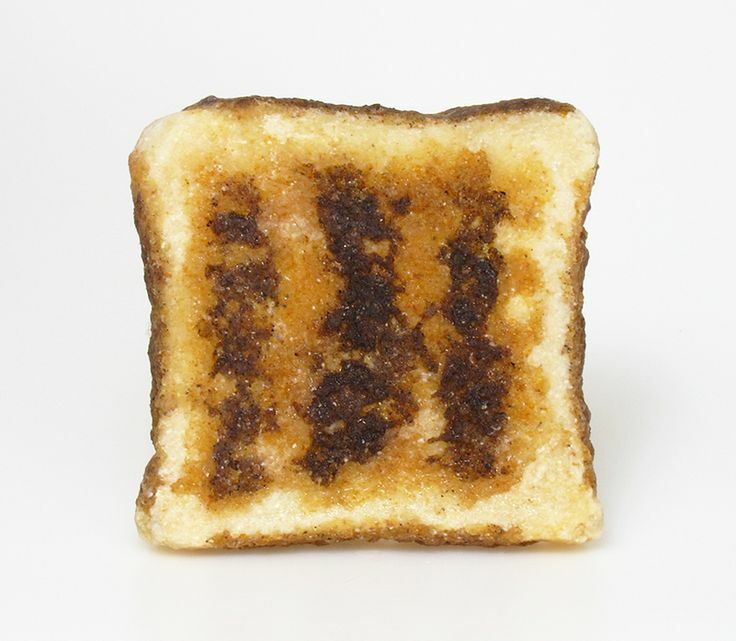 Their manual techniques are very clear and ooze from every pore: irregular edges, round shaped elements that are not quite round and squares that are not perfectly square. Duprè has a passion for metal and has established an intimate relationship with it over time. 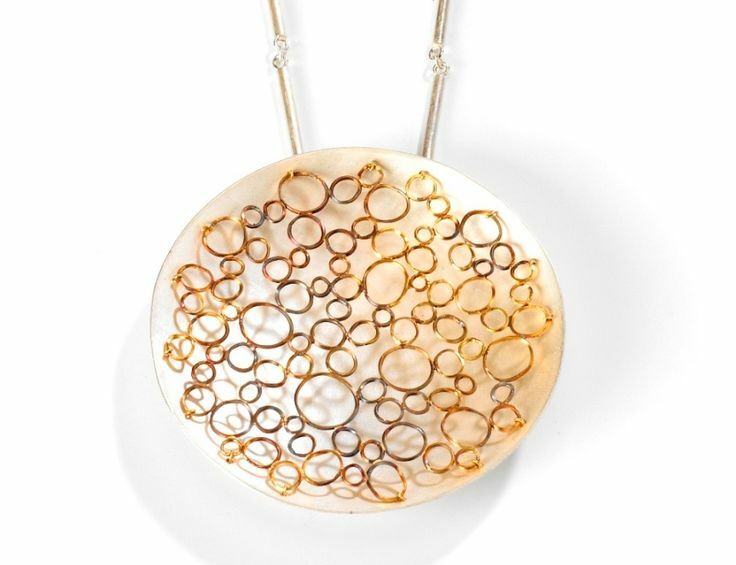 She has a profound knowledge of the secrets of silver and gold and avails herself of traditional bench techniques to make her pieces. The tools you would find in her workshop are those traditionally used by goldsmiths over centuries, employed with great expertise, to make jewellery that is, on the other hand, anything other than classic. Her works have never been overly explicit, although they seem to follow certain themes at times. This comes through very clearly in the pieces under the title « Persiana », in which the window blind is barely hinted, but at the same time we are given enough elements to perceive the artist’s intention. Her latest works have seen the introduction of movement, through the creation of mobile structures formed by many minute pieces of silver, left a milky white or blackened, held together by tiny rings, as if they were sewn. Again we see elements that are repeated, but as opposed to the past when they were two-dimensional, now they grow to form mobile volumes that follow the body’s movement. They are soft structures that plunge into the surrounding space. Hence, just like in a dance where the harmony of movement is the result of unity between two or more people moving together, likewise in these works, harmony arises from the perfect union between object and body. Curator of the Legnica Jewellery Festival SILVER: Monika Szpatowicz. 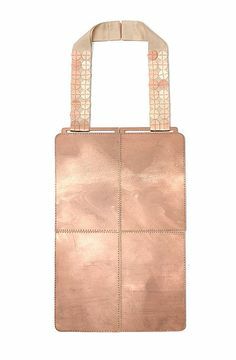 It was presented for the first time in October 2014 during The Jewellery Week in Barcelona, at Siesta Gallery who´s director is Mercedes Rodrigo. It was also presented in Galería Silvestre in Tarragona, Spain. Waking up after a sleepless night, looking at the pictures of the pieces showed at the exhibition, reading books randomly and remembering… Everything reappears along with a passage of Marcelo Mathey, the writer. He says that when he finds a beautiful place he fixes his gaze there to distinguish the small parts of it, or when looking at a house he tries to observe the people who live there. 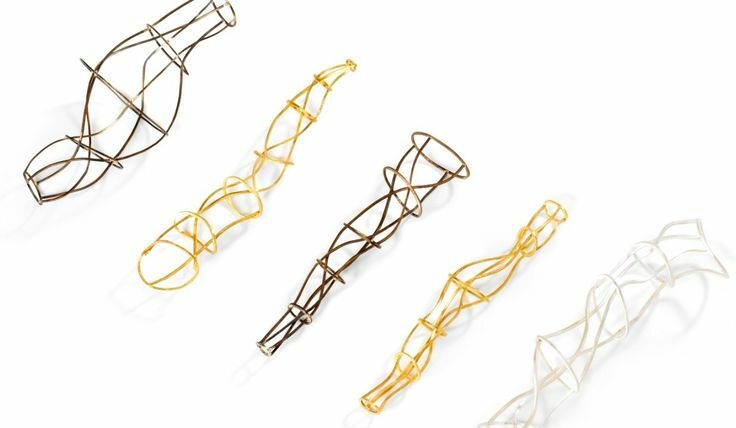 This is an almost accurate brief of the exhibition held at Galería Siesta in Barcelona that brings us Argentine Jewelry closer in the framework of the Barcelona Jewelry Week. Those artists showing their “souths” full of landscapes, spots outlining thoughts, inhabited places whose boundariesfade away while connecting stories and hemispheres of a feeling that can´t be catalogued. The competition and – being its result – exhibition is the main event of the Festival. Artists` task is to submit works on a given topic – a different one every year – characterised by an original creative idea and representing a high artistic and technical level. Preferred are concept, value and meaning of creative expression. Submitted works are qualified to the exhibition and awarded by the international jury. 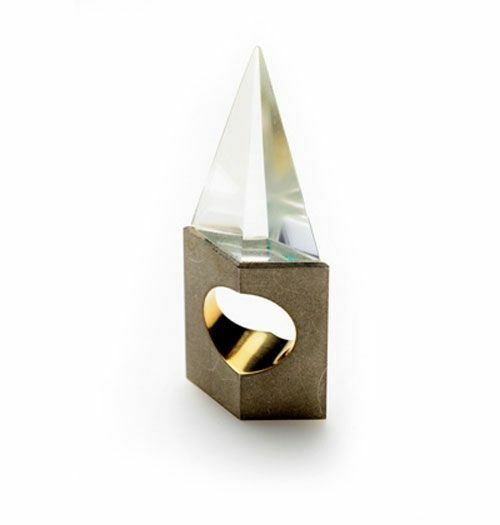 We know artists qualified to the exhibition of the 24th International Jewellery Competition BOUNDARIES ! On the 9th-10th April jury session of the 24th Legnica International Jewellery Competition BOUNDARIES took place. Jury constist of: Sławomir Fijałkowski (Poland), Suska Mackert (Germany), Ruudt Peters (The Netherlands), Zuzanna Skalska (Poland/The Netherlands), Gisbert Stach (Germany) and Christoph Zellweger (Switzerland), judged 605 works submitted by 337 artists from 42 countries and qualified to the exhibition 45 artists and chose awarded. Names of awarded will be anounced during the opening ceremony which takes place on the 16th May 2015. 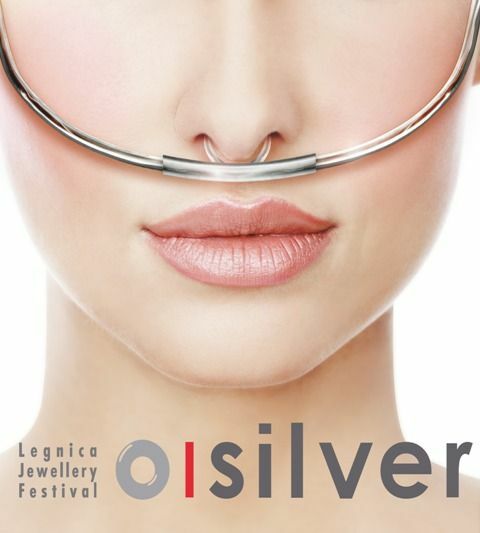 Legnica Jewellery Festival SILVER is the biggest and the most significant in Poland jewellery event, organized from over 30 years by the Gallery of Art in Legnica. Every year in its framework is presented over a dozen individual and group exhibitions of Polish and foreign artists and a number of accompanying events, like: theoretical seminar, authors lectures, jewellery and fashion shows, jewellery competitions and workshops, concerts and a variety of artistic actions and happenings taking place outside in the city space. Germany (Hochschule Wismar, Faculty of Design) and Lithuania (Vilnius Academy of Arts, Telšiai Faculty of Arts). 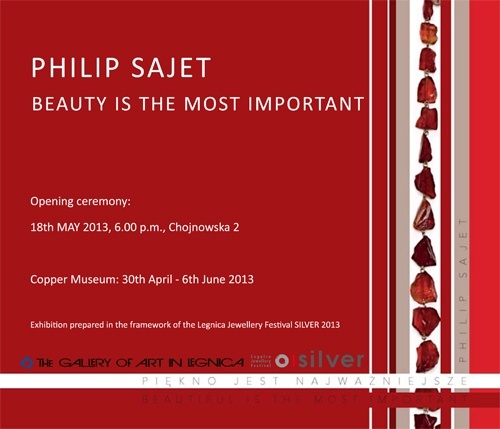 Recurring presentation of well-known Polish and foreign jewellery artists. * Special guest: Ruudt Peters: DUSZA - distinguished Dutch artist, driving force, organizer and lecturer, i.a. 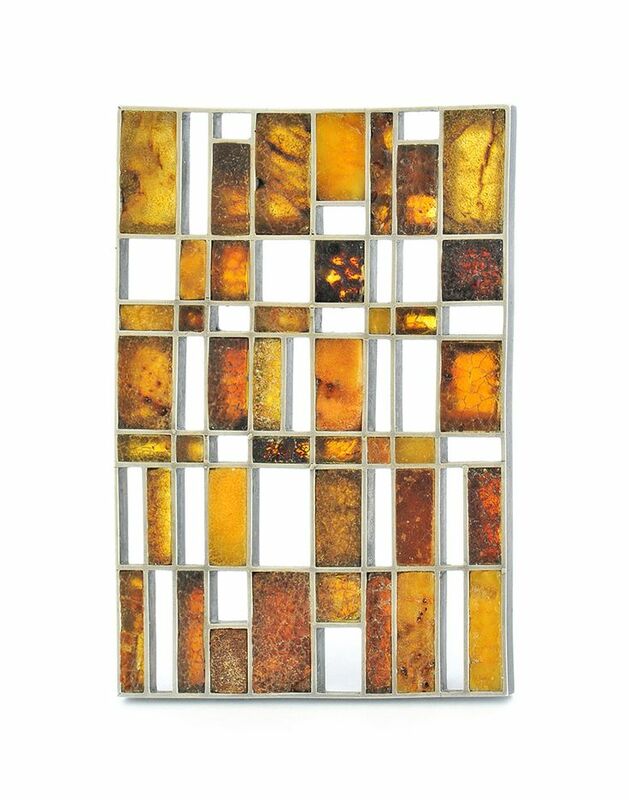 : co-founder of the Ekster Gallery in Leeuwarden, professor of many academies in Europe and USA, juror of many prestigious jewellery competitions, author of tens solo exhibitions around the world. 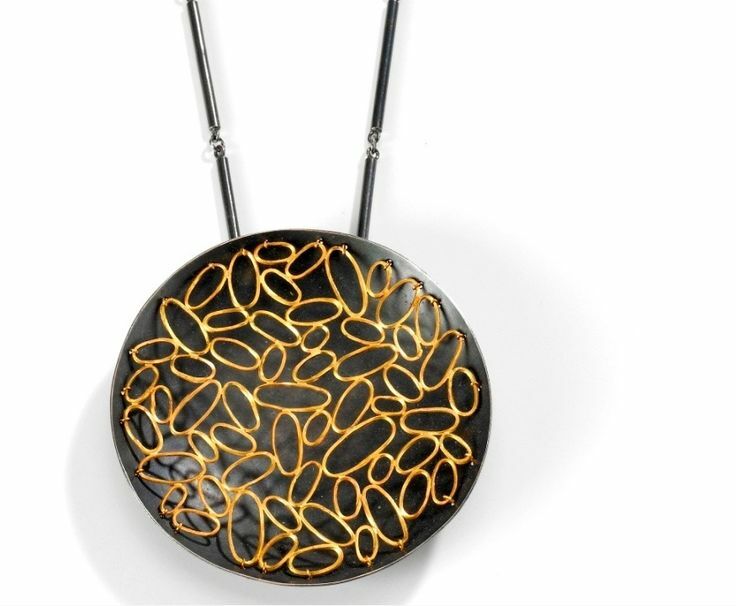 * Eunmi Chun: JEWELLERY – Korean artist, graduate of the Sookmyung University and Kookmin University in Seoul, as well as the Jewellery Department of the Academy of Fine Arts in Munich. Laureate of the prestigious Herbert Hoffmann Award in Munich (2008). 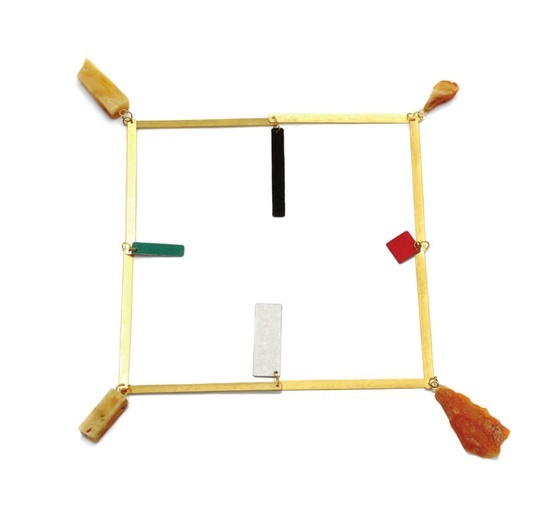 * Elisabetta Dupré: JEWELLERY - Italian artist, graduate of the Jewellery School « Interno 7″ in Roma and the « Atelier Aura » in Munich. Laureate of the Gallery of Art in Legnica Award in 23rd Legnica International Jewellery Competition CLASSIC. * Andi Gut: ON AND ON AND ON – exhibition of well-known Swiss artist, currently professor at the Pforzheim University, who invited to collaboration and presentation his professor Rüdiger Lorenzen and his students: Frieda Dörfer, Katrin Feulner (Germany). The exhibition presents three generations of artists. 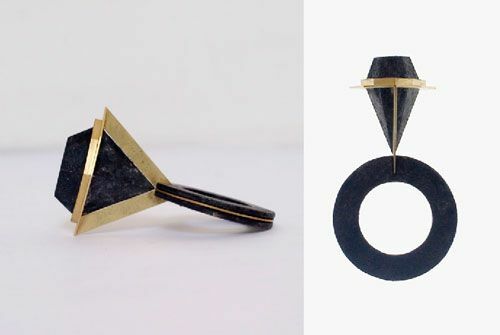 * Anna Król: JEWELLERY - graduate of the Graphic Department of the Academy of Fine Arts in Łódź, jewellery designer at Deco Echo company. 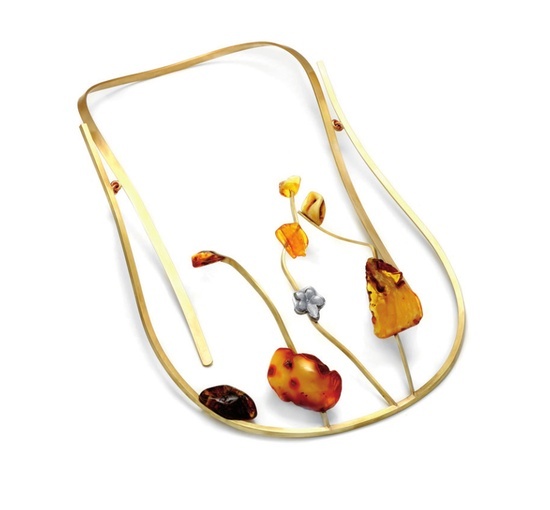 Participant of exhibitions in Poland and abroad, recently at the JOYA BARCELONA Contemporary Jewellery Fair 2014, where she was three times awarded. * Mia Kwon: VIVID! - Korean artist, graduate of the Kookmin University in Seoul and the Potsdam University of Applied Sciences, studied also at the Burg Giebichenstein University in Halle (ceramic design). Participant of numerous exhibitions all around the world. 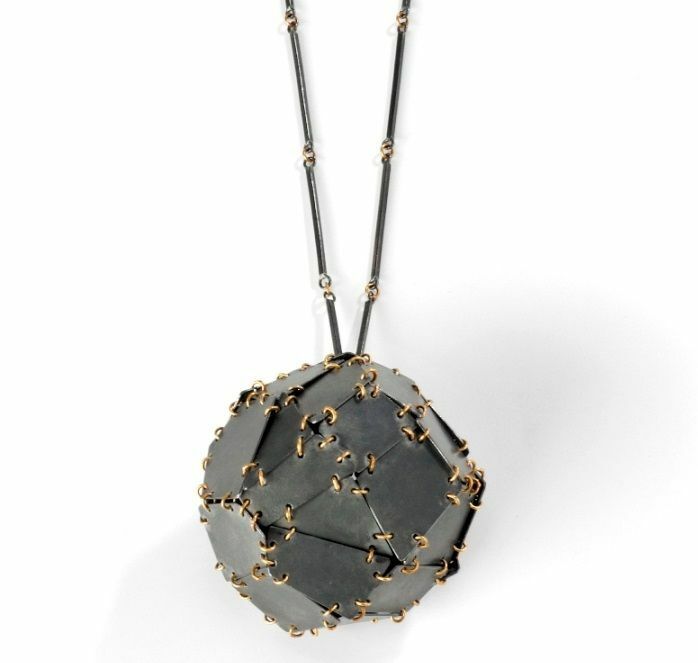 Laureate of the Gallery of Art in Legnica Award at JOYA BARCELONA Contemporary Jewellery Fair (2014). Recurring presentation of the most promising Polish young artists, taking their first steps in the world of design and goldsmithing. *Antonina Maria Łęcicka: Underwater city – student of the Faculty of Textile and Fashion Design of the Academy of Fine Arts in Łódź, laureate of the Award of the Gallery of Art in Legnica at Strzemiński Competition. * Karolina Szymanowska: Soul paradise - graduate of the Faculty of Painting and Sculpture and assistant at the Academy of Fine Arts in Wrocław, participant of art exhibitions. The exhibition is a symbolic summary of events and trends in the Polish goldsmithing in the last 25 years. Presents works of the 25 most accomplished Polish creators of artistic jewellery, who have contributed the most to the development of this art during that period. Participants of the exhibition: Andrzej Bielak — Paulina Binek — Andrzej Boss — Agnieszka Bruzda — Jacek Byczewski — Bogumił Bytomski — Piotr Cieciura — Sławomir Fijałkowski — Marcin Gronkowski – Joanna i Tadeusz Jaworscy — Paweł Kaczyński — Zofia i Witold Kozubscy — Cezary Łutowicz — Lucyna i Marek Nieniewscy — Jacek Ostrowski — Kamilla Rohn — Magdalena i Tomasz Stajszczak — Jan Suchodolski — Andrzej Szadkowski — Marcin Tymiński — Jarosław Westermark — Arkadiusz Wolski — Alicja i Jakub Wyganowscy — Marcin Zaremski — Hanna i Jacek Zdanowscy. The exhibition prepared on the occasion of the 25th anniversary of activity of the Polish Goldsmithing Artists Association (STFZ). The exhibition presents both recent as well as older works from the exhibitions organised by the STFZ over the years. 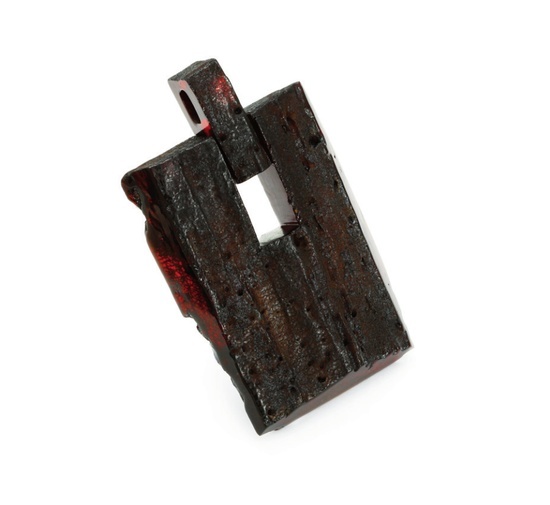 Collective exhibition of the Polish art groups working in the field of jewellery in the period 1945-2015. There will be presented: UFO, Muzeum, RE, G7, Au +, Dziewiątka, Punkt G, LIS2, 4 Women. 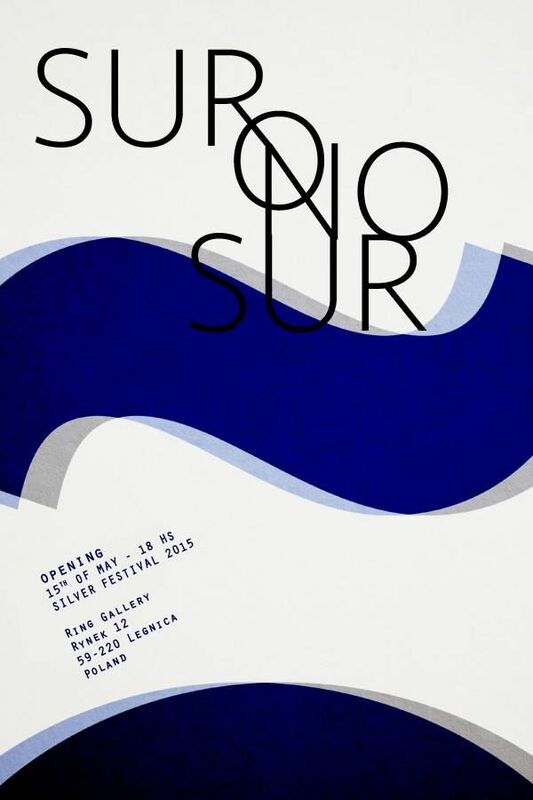 Exhibition presenting works of the Argentinian jewellers: Ana Weisz, Cecilia Hecker, Eva Burton, Elisa Gulminelli, Gabriela Cohn, Gastón Rois, Iacov Azubel, Jorge Castañón, Lucía Mishquila Brichta, María Carelli, Mercedes Castro Corbat, Patricia Rodriguez, Sabina Tiemroth, Rodrigo Acosta Arias. International project organized by Le Arti Orafe Jewellery School in Florence. Its aim is to present and popularise achievements of the young generation of goldsmiths and designers. Laureates of PY 2015 are: Deok Sang Han, Jie Sun, Soyeon Lee, Tithi Kutchamuch, Daniela Hedman. 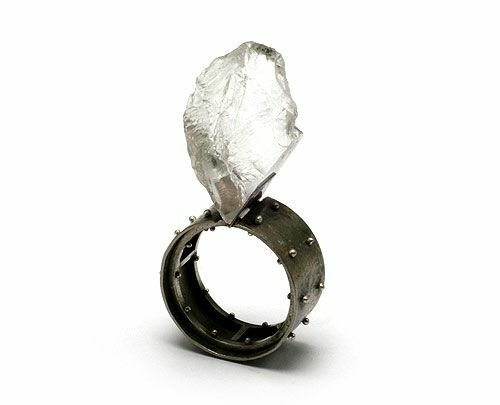 International jewellery exhibition, curated by Heidemarie Herb, a German artist living in Italy. 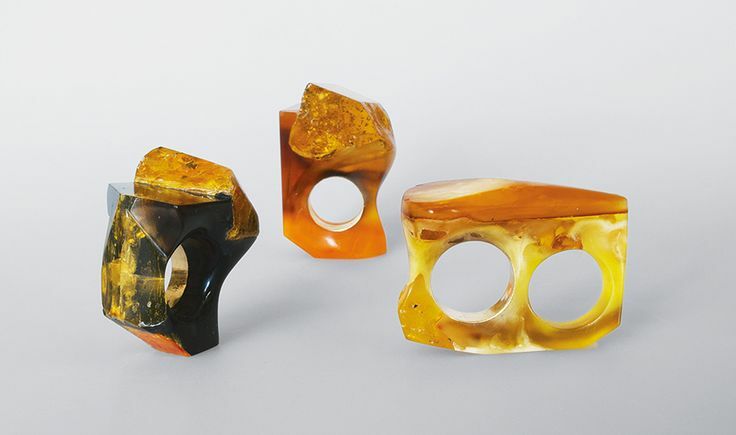 Exhibition showcases different approaches to amber in works by the well-known European artists, including ones who have been working in amber for many years and the ones who used this material for the first time for the purpose of this exhibition. 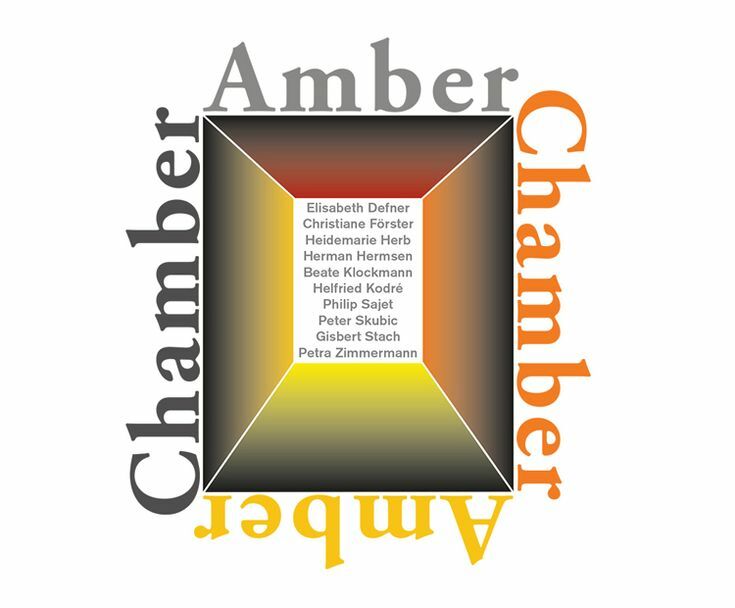 The participating artists are: Elisabeth Defner, Christiane Förster, Heidemarie Herb, Herman Hermsen, Beate Klockmann, Helfried Kodré, Philip Sajet, Peter Skubic, Gisbert Stach, Petra Zimmermann. The exhibition curated by Piotr Rybaczek from La Basílica Galería in Barcelona. Presenting works by 25 Polish artists inspired by the Anna Bikont`s book under the same title. Exhibition concentrates on examples of avant-garde use of Baltic amber created by 24 well-known jewellery designers from 12 European countries, invited by curators: Wim Vandekerckhove, owner of the Villa De Bondt in Ghent and Sławomir Fijałkowski, a professor of the Academy of Fine Arts in Gdańsk. 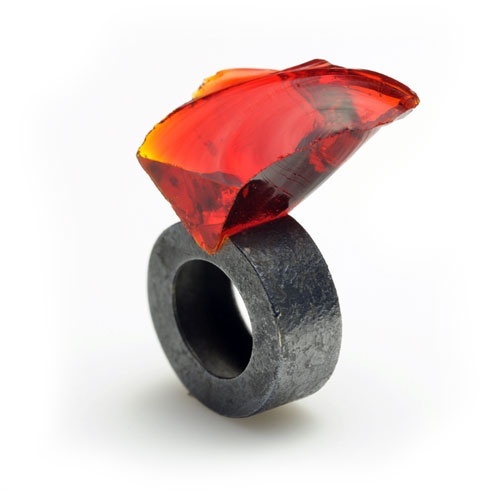 International Competition for the Design of Jewellery with Amber, organized by the International Fair of Amber, Jewellery and Gemstones Amberif in Gdańsk, aiming to promote the creative thought and innovation solutions in the field of amber jewellery design. Exhibition of a few hundred of works all over the world submitted to the 24th Legnica International Jewellery Competition BOUNDARIES, but not selected for the main exhibition. Its name is taken from the place, where it is held – a foyer (Polish « hol ») of the Old City Hall. Exhibition of works of Polish artist graduate of the Wł. Strzemiński Academy of Fine Arts in Łódź, currently an associate professor at the Goldsmithing Forms Atelier led by Prof. Andrzej Boss in her alma mater. Laureate of awards and participant of more than 70 exhibitions in Poland and abroad. Exhibition of artist, graduate of the Interdepartmental Environmental Doctoral Studies at the Department of Interior Architecture and Design of the Academy of Fine Arts in Gdańsk. Participant of group exhibitions and laureate of awards and mentions (Legnica, Gdańsk, Florence). Group exhibition of the conceptual works by young Polish artists (Marcin Bogusław, Bartosz Chmielewski, Filip Jackowski and Michał Wysocki), graduates of the Wł. Strzemiński Academy of Fine Arts and Design in Łódź. Recurring science session, for 15 years accompanied the Festival, commenting the current status of art, contemporary jewellery and design. It`s an opportunity to reflect on the latest trends, methods and phenomenon in contemporary art in general, especially in the context of the competition topic (in 2015 – BOUNDARIES). The session involved artists and designers, historians and art critics, philosophers, culture experts, cultural anthropologists, sociologists and the wide audience. Exhibition presenting works qualified in national, photographic competition on the topic BOUNDARIES – a leitmotif of the Legnica Jewellery Festival SILVER. Traditionally the concert closes the first day of the culmination of the Festival. This year Cracow Jazz Trio: Tolek Lisiecki, Wojciech Groborz and Jacek Mazur will perform. Throughout the Festival, a cinema is open showing documentaries about personalities from the art and design field and the video films created by both professionals and amateurs especially for the festival’s use and inspired by its title – will run the cycle of screening of artistic and documentaries movies dedicated to personalities of the design art, created by professionals and amateurs and inspired by the topic: BOUNDARIES. 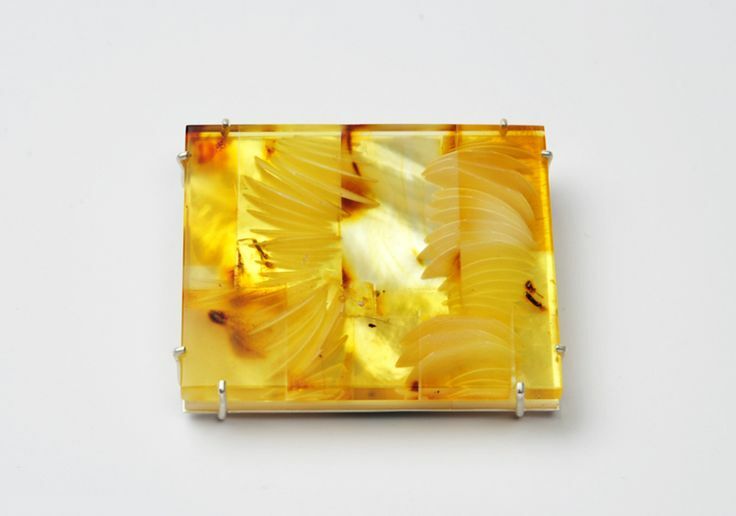 The opening of the travelling exhibition, which presents ten renown artists taking a fresh look on amber, coincides with the Legnica Jewellery Festival Silver. 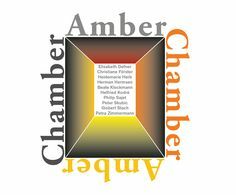 This exhibition shows a number of different approaches to amber, running the gamut from artists working with amber for the first time, to those who have been working with it for an extended period. 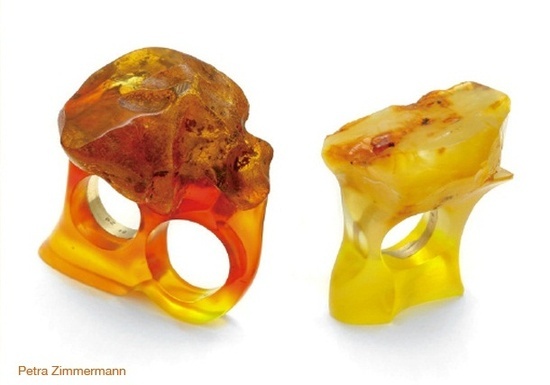 The contrasts in these works should help to update the traditional and still rather one-sided view of amber jewelry, showing new possibilities about this interesting material. Preziosa Young 2015 – and the winners are ……..
…. and the winners are …. PY2015 will be previewed at Inhorgenta 2015 (Munich – 20.02 – 23.02.2015), with the presentation of some works of each artist. The full exhibition will then hosted at the “Legnica Silver Festival” (15-16 May 2015), in Poland, and then finally in Florence. PREZIOSA is a cultural project designed and co-ordinated by “Le Arti Orafe”, since 1985 the most prestigious contemporary jewellery school in Italy. 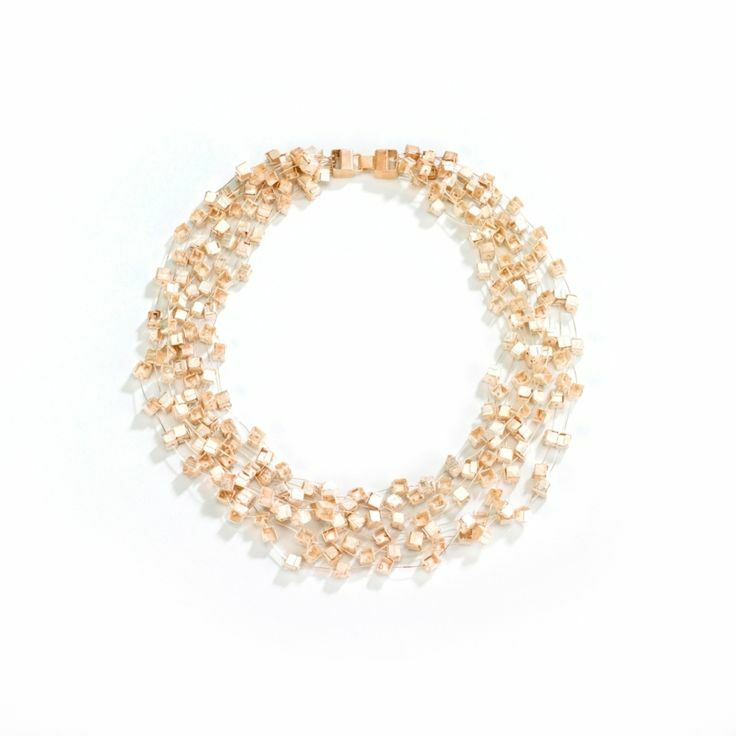 The project, launched in 2005, has become one of the most important European events devoted to contemporary jewellery. 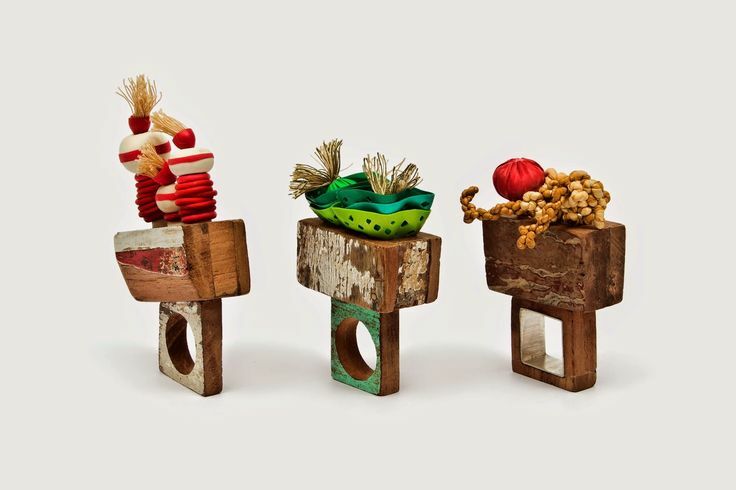 The conceptual quality, the presence of artists of international fame, the prestigious set-up, the elegant catalogues and the original formula that comprises the organisation of conferences with the artists taking part, make “Preziosa” an appointment that lovers of contemporary jewellery cannot afford to miss. A country of exquisite jewellery traditions, Italy has no museum devoted to jewellery, and temporary exhibitions have always been rare. The attention devoted by the communication media and the cultural institutions to initiatives devoted to this art form has – apart from a few shining exceptions – always been limited, while great interest has always been expressed by lovers of contemporary art. Through the organisation of events such as PREZIOSA, the school wishes to help to fill a gap the discrepancy of which is more or less consciously acknowledged. 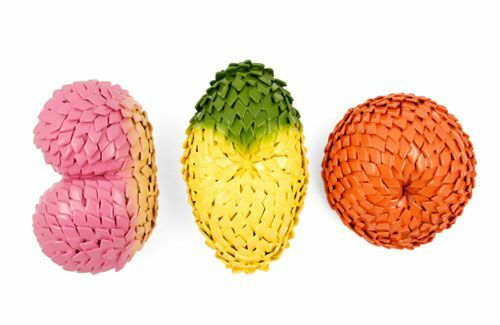 The simplicity of reproduction of subsequent stylistic incarnations grows parallel with introducing of subsequent versions of 3D modelling software and rapid prototyping technologies. Today, the race of the artistic radicalisms ends inevitably as a Youtube “freak of the week”. The economic pressure of efficiency forced the traditional craftsmanship into the sphere of anthropological phenomena. but, it is not true that “everything has already happened”. Everything has happened many times and nevertheless the historical retrospection and the necessity of original reinterpretation of the classic canons of the art of goldsmithing still appear inspiring. Let’s try again then to discover the timeless. 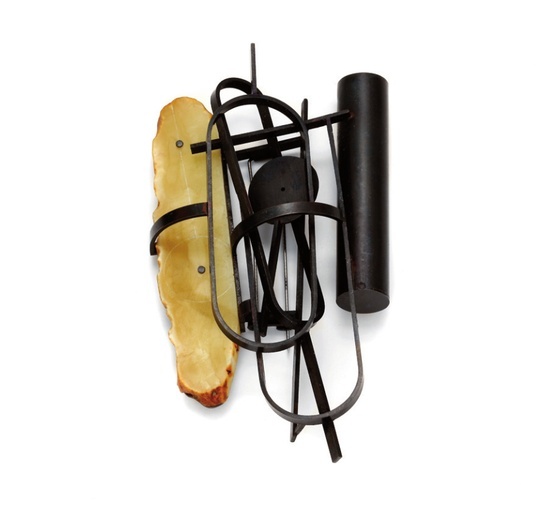 Philip Sajet tries, through goldsmithery, to combine the incompatible in his pieces. Thus the sharp glass shard penetrates the round metal setting of the ring, a green stone butts up against the delicate pearl, a classically cut, precious stone is sawn through and put back together. This is not about the destruction or extraction of something fragile but about emphasising that the one is not possible without the other. Harmony, balance comes through the combination of the various elements. Shells, a fragile and delicate material, used by man as jewellery for thousands of years, are combined by Sajet into a stole which can be seen in the accompanying photograph magnificently adorning a naked body, to which it lends an unassailable aura, like armour. The intangible, elusive glitter of a cut stone is replaced with metallic constructions which mimic it and turn the gentle glimmers into thorns. In the earrings the facets are imitated, but only the edges and not the light which emanates from gemstones. Small stones in their natural state are found at the connections, brightening the cool, aloof construction. 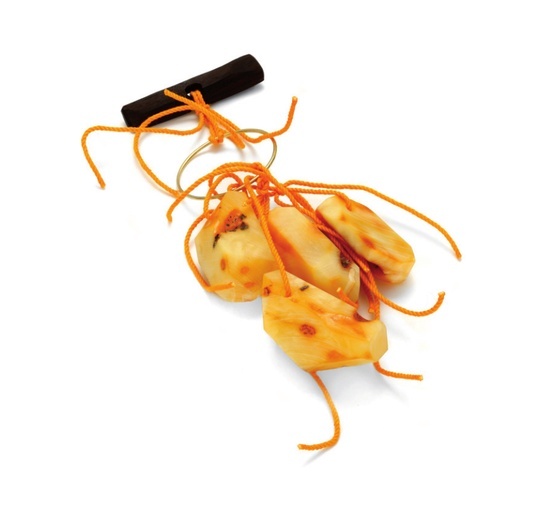 Tiny and raw, they breathe life into the piece. 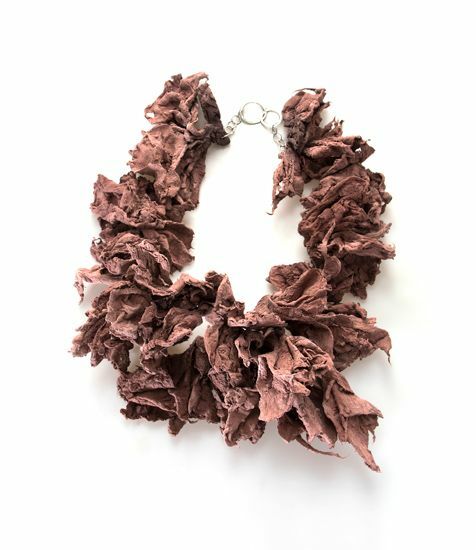 Sajet’s jewellery has a unique, distinctive use of form but it is made to be worn and through wearing to change its impact, breaking free from its artist-creator and developing its own life. 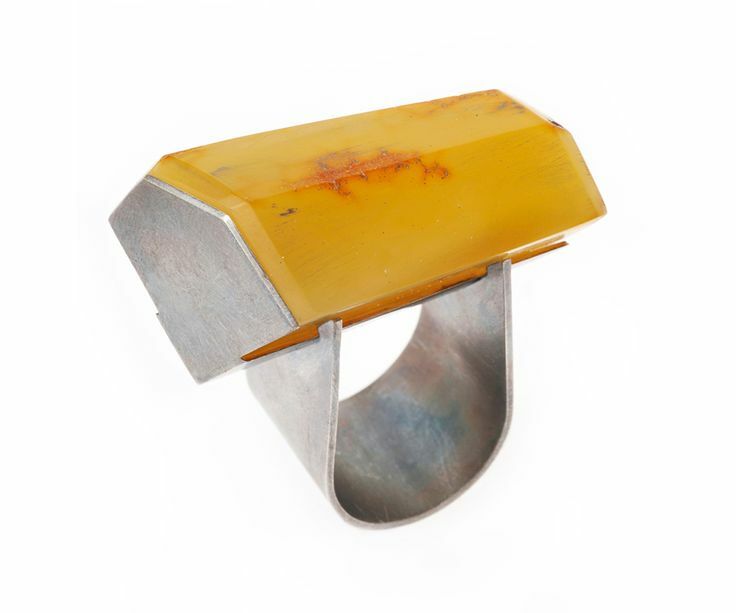 The wearer too will change on wearing the piece, as it connects to his or her personality and deliberately draws in the attention of a third party, the beholder. 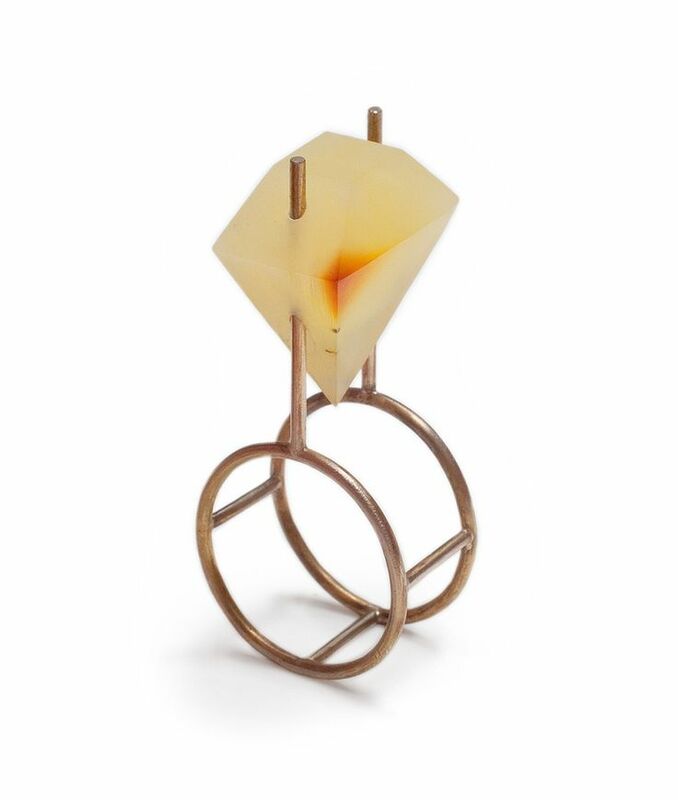 In this light it is hardly surprising that Sajet has produced predominantly rings, earrings and close fitting necklaces which adorn the hands and frame and highlight the face. These are the parts of the body which stand for the expressive side of the personality; our facial expressions and gestures communicate with others, emphasise our nature, the unsaid and the said.